I'm not the Scribal-Answer-Lady, and I don't care to be. However, discussing things scribal with others is important to build skills, knowledge, connections, and fun. Where do you go for that? As a 35-year SCAdian, it pains me to answer...Facebook. Facebook provides you comfort, hope, purpose, and validation as a member of a community. It's a place to share interests and concerns. But it's huge. I find discussing things is better in smaller groups, even on Facebook. Perhaps you do too. To help you connect, if you haven't already, here is my scribal Facebook Group collection. Calligraphy For The Left Handed is a public, small-membered public non-SCA group dedicated to "sinister" (left-sided) letterers. Falcon Scribes is a "closed", Calontir focused, small-membered scribal arts discussion group. A place for advice, inspiration, and Kingdom scribal coordination. 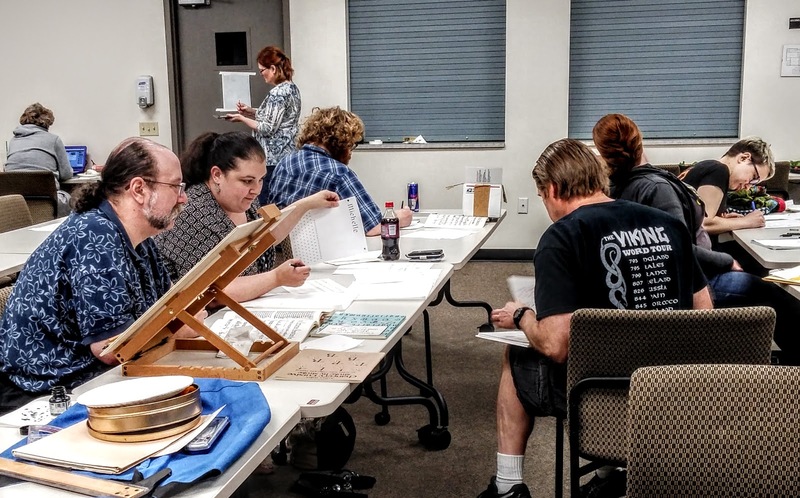 SCA Calligraphy Boot Camp is a "closed", medium-membered calligraphers' group, encouraging skill development through monthly projects and active posts. They also have a separate website. SCA Scribes is a public, large-membered, general discussion group dedicated to SCA scribal arts, advice, and inspiration. SCA Scribes and Illumination is a public, medium-membered group discussing SCA scribal arts. SCA Scroll Gallery is a medium-membered, "closed" group sharing SCA scroll images and information for recipients and artists. groups similar to the Falcon Scribes. There are probably some on other social platforms, as well. So don't stop with these. If you don't find what you want, keep looking. Or, you can form your own group. Don't be shy like I was before the Internet. Connect with a scribal group and make friends. And if you know of an online scribal group I missed please share it in the comments section below.